Now you can create and run Facebook and Instagram ads when you’re on the go. Here, you’ll learn how to create a social ad with Mailchimp’s mobile app. Creating an ad through Mailchimp is a multi-step process. Here's how it works. Connect your business's Facebook Page. If you want to post ads to Instagram, you’ll also need to Add Instagram to Your Facebook Page. Target an audience of your contacts, brand new people who are similar to your contacts, people with specific interests, or your site visitors. Decide how much to spend on your ad. 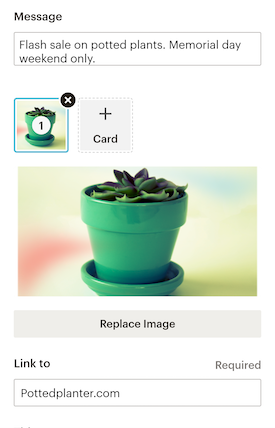 Create a static image ad, a GIF ad, or an ad with multiple static images in carousel format. After you submit and confirm your Facebook or Instagram ad, we'll send it over to Facebook for review. Facebook will review the ad to make sure it fits their Advertising Policy. This process can take a bit of time, depending on Facebook's queue. Post ad on social media. When Facebook approves your ad, we'll let you know via email that your ad will appear online soon. Ads can appear in Facebook Feeds, Facebook Instant Articles, and Audience Network (visible on mobile only), or in Instagram feeds. Ad results will be updated daily in the Reports page of your Mailchimp account, where you can also view comments and likes. Here’s how to create an ad on your iPhone or iPad. In the Mailchimp mobile app, tap the Campaigns tab. Tap the pencil icon in the upper-right corner. 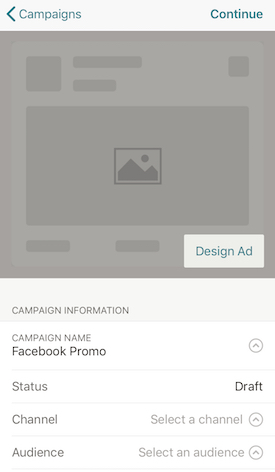 Tap the relevant sections on the Campaign information screen to choose your ad’s Campaign Name, Channel, Audience, and Budget. Tap Design Ad to open the Ad Builder. 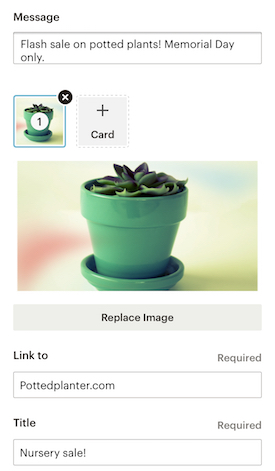 Tap the relevant sections to edit your ad’s Message, Image, Link to address, Title, Description, and call-to-action Button. When you’re done with design, tap Save at the bottom of your screen. Tap Exit to view the ad preview. If the preview looks good, tap Exit again to go back to the Campaign information screen. You’re almost done. Confirm your billing information in the fields provided, and tap Save. Touch and hold the button to confirm the purchase. We’ll send your ad over to Facebook for review. Keep an eye on your inbox for a receipt and updates on your ad’s status. Here’s how to create an ad on your Android phone or tablet. 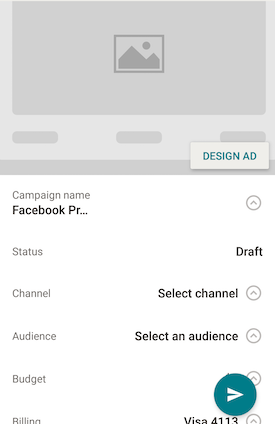 Tap the relevant sections on the Campaign details section to choose your ad’s Campaign Name, Channel, Audience, and Budget. If the preview looks good, tap Exit again to go back to the Campaign details section. You’re almost done. Tap the send button in the lower right corner of the screen. Need more help with ads? Check out these resources. Learn tips for creating your ad's content. Learn how to prevent ad submission problems, and correct and resubmit rejected ads.